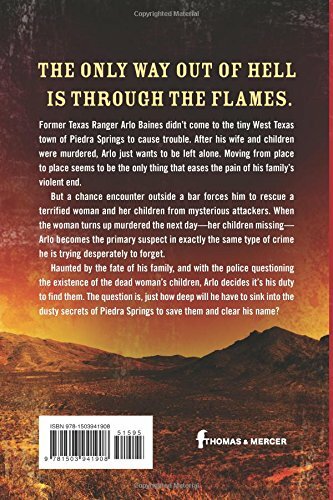 Former Texas Ranger Arlo Baines was just passing through Piedra Springs, Texas, with nothing more on his mind than enjoying the peace and quiet and a good book. Haunted by the memories of his deceased wife and children, he just wants to be left alone as he drifts from place to place. With just five folks in the only bar in the tiny West Texas town, if he counted himself and the bartender, he thought the odds were in his favor. He also thought the threat posed by any of the clientele was low to nonexistent. That was until Suzy took more than a passing interest in him. She is clearly trouble in more ways than one and is also in trouble herself. It is also obvious to the former lawman that the man she is with is a significant problem. A problem that is not just going to go away on its own as the interest that Suzy showed in him was a small piece of the far bigger issue. Predictably, it is not long before the situation has moved outside to a parking lot outside the bar. Then things really go sideways and pull the disgraced former Texas Ranger into a hideous mess involving the Russian mafia, a cult, multiple murders, and more. 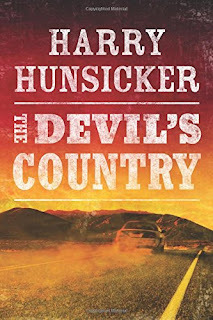 The Devil’s Country is very reminiscent of a Reacher series book. Loner, with a military or, in this case, over a decade in law enforcement by the way of the Texas Rangers (the real deal and not the baseball team in Arlington), comes into town, and just wants to be left alone. Alone to nurse his drinks, his thoughts, and his haunted memories of the past. All is fine until there is a person in distress that needs help. Usually the person is a woman which triggers our loner hero’s need to be a knight in shining armor to protect the fair damsel. Upon intervening, the loner hero runs afoul of the local law (who may or may not be as crooked as a dog’s hind leg). Arrested the first time (loner hero will spend lots of time arrested) and then released for whatever reason, said loner seeks to have questions answered and garner support. As it happens, many of the local populace are either part of the unspoken nefarious deeds, criminal conspiracy, or on the outside and powerless to stop it as they are heavily weighed down emotionally, or physically, or financially, or all of the above. Said loner begins to wage a one person war to fight back for justice and intends to destroy the evil doers so that the place can be turned back over to the few good folks living in the area. Loner hero will have some help along the way that almost always will include at least one female, who may or may not, become physically intimate with the loner as she understands him and seeks to heal him at least a little bit. All that, like in a Reacher series novel, is certainly present in The Devil’s Country. All that being said, even when you know the framework and can predict with a high degree of accuracy how things are going to play out, author Harry Hunsicker throws a few curveballs while unleashing a fast moving and very entertaining story. 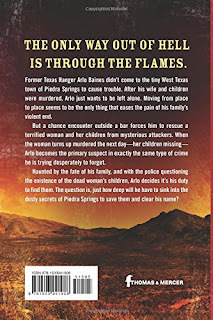 Violent and complicated, the read moves forward at a rapid pace as Arlo Baines works to solve the many unspoken mysteries of Piedra Springs. The second book in the series, Texas Sicario, is due out on January 15, 2019. Material supplied by the good folks of the Dallas Library System.